Round Ice Blue Sapphire, Baguette and Round Diamond Ring | Shane Co.
A single round ice blue sapphire (approx. .64 carat) is beautifully highlighted by 48 round diamonds (approx. .38 carat TW) and four baguette diamonds (approx. .14 carat TW) in this colorful ring. Crafted of quality 14 karat white gold, the 7.5mm ring has a total gem weight of approximately 1.16 carats. 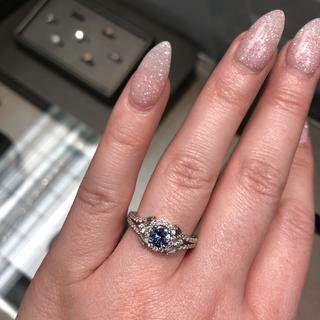 This ring is so stunning! Seriously not accurately portrayed on the site. It almost looks bulky online, but in person it is so sparkly, unique and delicate. 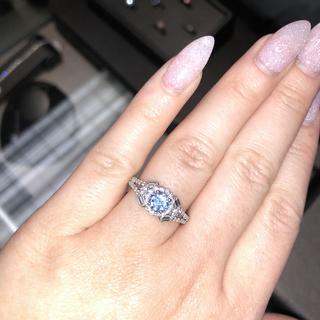 I fell in love with it as soon as I tried it on and I had gone there with a completely different ring. I couldn’t leave without it!